Robert Watt, the first Chief Herald of Canada and now Rideau Herald Emeritus, will be visiting Australia on a family holiday in February of this year. After a little badgering, Mr Watt has agreed to take some time out of his busy schedule in order to address a meeting of members of our Society and other interested parties in Melbourne on the evening of Monday 13 February 2017. Mr Watt will speak on the topic of “Watts and the oak tree”, which is based on a paper he presented at the XXXII International Congress of Genealogical and Heraldic Sciences in Glasgow last year. 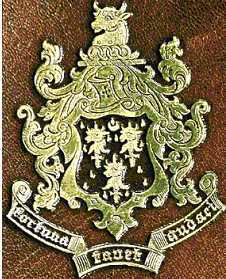 The paper explored all the arms on record in the Court of the Lord Lyon, both in the Public Register of All Arms and Bearings and in documents preceding 1672, which were borne by individuals of the surname Watt. The majority of these feature some version of the Oak tree, often Vert, often rising from a mount Vert. One of those armigers was John Brown Watt, a Member of the Legislative Council in New South Wales, whose arms were granted by Lyon in 1895. He had numerous descendants in both male and female lines, and some of them are still living in Australia. The aim of the paper was to discover, by using these records and supplementing them with documents in the Scottish National Library, whether any reason for linking this surname to the tree can be found and to what degree, if any, the bearers of these arms were related in blood. In 2005 we had the pleasure of hosting a lecture in Sydney by Robert Watt in which he gave a thorough and fascinating overview of the establishment of the Canadian Heraldic Authority in 1988, with numerous examples of arms granted since that time. A transcript of the lecture, with a supplementary volume containing all the illustrations of arms referred to in that lecture, were published as Heraldry News #39 and #39a, copies of which are available for purchase. Entry is by way of gold coin donation, and bookings are essential as space is limited. Please contact the Secretary of The Australian Heraldry Society to make a booking, either by e-mail on secretary@heraldryaustralia.org or by telephone (voice or text message) on 0431 701 055. Please RSVP by Saturday 11 February 2017. For centuries, Freemasons have played a significant, if somewhat controversial, role in the development of our society, financing major public buildings and works of charity, yet intriguing us with their secrets, signs and symbols, of which only a few of us will ever get to know. However, there is one facet of Freemasonry which is never hidden; their heraldry. Masonic institutions proudly display their arms and symbols on buildings, documents and letterheads, as well as on their silverware and the banners they parade in public. Come and explore the fascinating world of Masonic heraldry and learn the meaning behind some of those esoteric symbols. I promise you, you’ll be intrigued! We’ll meet upon the Level an’ part upon the Square! Doors open 10:00AM, talk to commence at 10:15AM. Refreshments are available prior to the meeting, and entry to the meeting is by gold coin donation. A raffle will also be held. For further information and to make a booking please contact the Secretary on secretary@heraldryaustralia.org, or by telephone on 0431 701 055. We have belatedly learned of the passing of a knight who was, for many years, a member of our Society. Sir John (Soong Chung) Yocklunn died on 7 April 2016, less than a month short of his eighty-third birthday. An article titled “East Meets West: The Arms of Sir John Yocklunn” appeared in Heraldry News #46 (November 2007) on pages 22 to 28. As well as providing the text of the Letters Patent for the arms, crest and badge granted to Sir John in 1984, the article contained a brief but comprehensive account of Sir John’s career and achievements up to 2007. John Yocklunn was born in Canton, China, and emigrated to Western Australia in 1938. He was a diligent student at all levels of education, ultimately achieving the degree of Master of Arts from Sheffield University. In 1959 John Yocklunn began to work at the Treasury Department in Canberra, moving to the National Library of Australia in 1964. In 1964 he went to Papua New Guinea, then under Australian administration, and served in various roles, most notably as Chief Executive Officer to Chief Minister, Michael Somare, National Librarian and Head of Protocol. John Yocklunn played an integral role in PNG’s move towards becoming an independent nation, which was recognised by the conferring of the rank of Knight Bachelor on him on 16 September 1975, the day Papua New Guinea achieved independence. Sir John was Assistant Director for the Royal Tour of Prince Charles in Papua New Guinea in 1975, and Director of the Royal Tour of Queen Elizabeth and Prince Phillip in 1977. He was made a Knight Commander of the Royal Victorian Order for his services in organising that tour. He reprised this role for another Royal Visit in 1982. Returning to Australia in 1983, Sir John was to become Deputy Chairman of Chinese Australian Museum, Melbourne and Director of Library Services, Monash University (Gippsland Campus). On retirement in 1998 Sir John and his wife Patricia moved to Rockhampton in Queensland, where he continued to serve the community in a variety of voluntary roles. In 2012 Sir John suffered a series of strokes which affected his speech and memory, requiring a level of care that could no longer be provided at home. He spent the last several years in a nursing home. Salve et Vale, Sir John! The next meeting of The Australian Heraldry Society in Sydney will be held on the evening of Friday 8 April 2016 at the Sydney Mechanics School of Arts, 280 Pitt St, Sydney. Doors open at 6:00PM with the presentations to commence at 6:30PM. Above: An early 20th century photograph with the windows from Miss Porter’s House in the background. 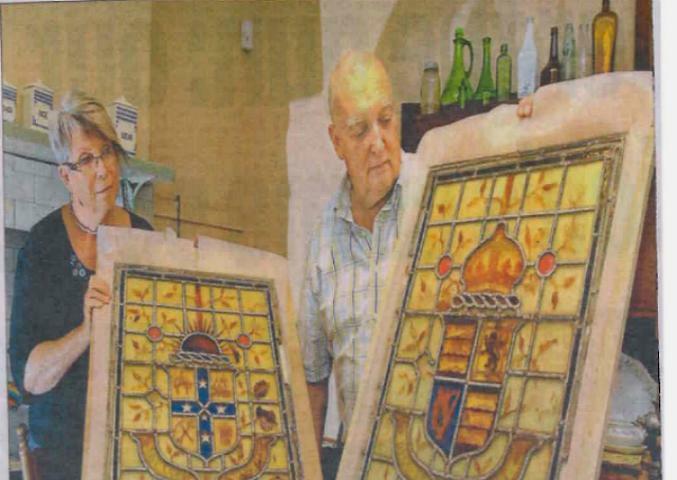 Our President, Richard d’Apice AM AAIH, will revisit a presentation which he first gave at a fund-raising dinner held by the National Trust of Australia (NSW) in Newcastle in November 2015 titled “Armorial Glass at Miss Porter’s House”. This focuses on two leadlight panels featuring arms which were formerly installed in the front wall of the bush house at Miss Porter’s House, a National Trust property in Newcastle West. Richard’s presentation explains the heraldic symbols which appear on the panels and speculates on their origins. Restoration work on the panels is underway, and Richard hopes that it will be completed in sufficient time so that he might be able to include post-restoration photographs of the panels. At the same meeting our Secretary, Stephen Szabo, will give a brief presentation on “Colonial Heraldry at the Heart of Empire: Condor House, London”. Please endeavour to advise the Secretary if you intend to attend this meeting, by responding in the comments section below, by sending an e-mail message to heraldry_aust@optusnet.com.au or by phone call or text message to 0431 701 055. This courtesy is greatly appreciated as it assists in setting up seating in the room and planning for catering. A gold coin donation to assist with hiring costs is also appreciated. The “city of churches” is also a city of heraldry, as this illustrated lecture on arms to be found in South Australia’s capital will demonstrate. The speaker, Ben Franklin, is a long-time member of The Australian Heraldry Society, and has given a number of colourful and entertaining presentations over the years. The meeting is to be held at our regular venue of The Sydney Mechanics School of Arts, 280 Pitt St, Sydney. Please advise by e-mail (secretary@heraldryaustralia.org), by telephone (0431 701 055), or in the comments section below if you are able to attend, in order to assist the Secretary with planning catering and seating arrangements. A gold coin donation towards costs is always appreciated. Photographs below are by long-time member Richard Num. We will, however, continue to post items here for the foreseeable future. On the evening of Thursday 12 November 2015 our President, Richard d’Apice AM AAIH, will be guest speaker at a fund-raising dinner being held by the National Trust (NSW) in Newcastle between 6:15pm and 9:30pm. For the cost of $40 per person, guests will have a meal prepared by students enrolled in the Food Services and Hospitality Course at Hamilton TAFE College, located at 91 Parry Street, Newcastle West. There will be a cash bar for drinks. The purpose of the dinner is to raise funds to help restore two leadlight panels featuring arms which were formerly installed in the front wall of Miss Porter’s House, a National Trust property in Newcastle. The panels will be on display at the dinner and Richard will explain the history of the panels and the heraldic symbols on them. Entry is by gold coin donation and refreshments will be available prior to the lecture. There will also be a raffle. In “Heraldry Across The Tasman: Early Grants of Arms to New Zealanders”, Somerset Herald expands on a presentation originally given in 2000. 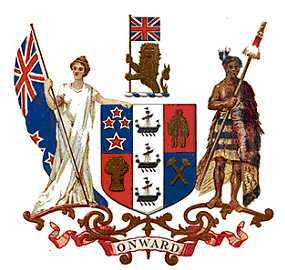 With some forty illustrations largely taken from the records of the College of Arms, the lecture will show grants of arms made to New Zealanders from the 1860s until the 1940s. Examining the symbolism of the arms and discussing the motives of the grantees, parallels will be drawn with grants made to Australians in the same period. New College, Oxford (founded 1379), does a nice line in “coffee art”. A bit worried by the use of the term “crested coffee”, though. The Australian Heraldry Society Inc.